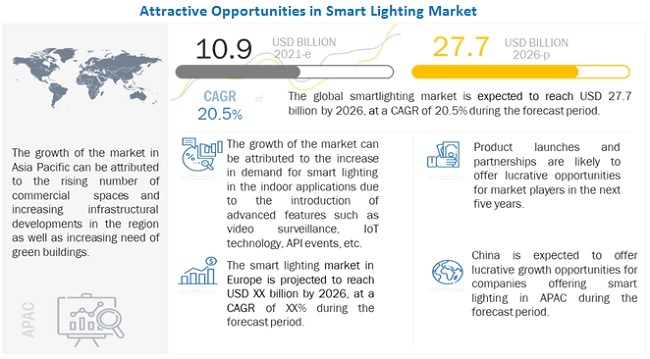 [169 Pages Report] The overall smart lighting market was valued at USD 6.32 Billion in 2017 and is estimated to reach USD 20.98 Billion by 2023, at a CAGR of 21.50% during the forecast period. The base year for this report is 2017, and the forecast period considered is between 2018 and 2023. The major factors driving the growth of the smart lighting market include the modernization and development of infrastructure to transform cities into smart cities, increased demand for intelligent solutions for street lighting systems, need for energy-efficient lighting systems, increasing adoption and decreasing cost of LEDs, and growing awareness about energy savings among consumers and governments worldwide. The report aims at estimating the size and growth potential of the smart lighting market based on offering, communication technology, installation type, application type, and geography. The report analyzes the structure of the market by segmenting the smart lighting market on the basis of the said segments. It aims at identifying the major trends in the smart lighting industry along with the factors driving or restraining the growth of the smart lighting market and its various submarkets. Moreover, this report analyzes the value chain of the smart lighting ecosystem. Furthermore, the report analyzes opportunities in the market for stakeholders by identifying the high-growth segments in the smart lighting market, strategically profiles the key market players, and comprehensively analyzes their market share and core competencies in each segment. The research methodology used to estimate and forecast the smart lighting market begins with obtaining data regarding the key vendor revenues through secondary research. Some of the secondary sources referred to for this research include The Lighting Industry Association (Europe), American Lighting Association (US), Global Lighting Association, Lighting Controls Associations, and the Federal Highway Administration (FHWA). The vendor offerings have also been taken into consideration to determine the market segmentation. The bottom-up procedure has been employed to arrive at the overall smart lighting market size using the revenues of the key players. After arriving at the overall market size, the total market has been split into several segments that have then been verified through primary research by conducting extensive interviews with key industry experts such as CEOs, VPs, directors, and executives. The market breakdown and data triangulation procedure have been employed to complete the overall market engineering process and arrive at the exact statistics for all segments. The smart lighting ecosystem includes original equipment manufacturers (OEMs) such as Acuity Brands (US), Honeywell (US), Philips (Netherlands), Cree (US), Legrand (France), and OSRAM (Germany). Key software providers in the market include Philips (Netherlands), Zumtobel Group (Austria), and SoftDel (US). Moreover, key technology providers include Control4 Corporation (US), Siemens (Germany), Ingersoll-Rand (US), and General Electric (US). 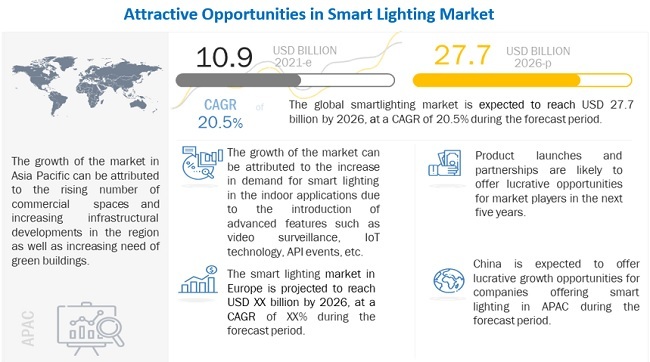 The smart lighting market is estimated to grow from USD 7.93 Billion in 2018 to USD 20.98 Billion by 2023, at a CAGR of 21.50% between 2018 and 2023. The forecast period for this report is considered between 2018 and 2023. The factors driving the smart lighting market include modernization and development of infrastructure to transform cities into smart cities, increased demand for intelligent solutions for street lighting systems, need for energy-efficient lighting systems, increasing adoption and decreasing cost of LEDs, and growing awareness about energy savings among consumers and governments worldwide. In this report, the smart lighting market has been segmented on the basis of communication technology, offering, application type, installation type, and geography. Among the communication technologies considered in the report, the market for wireless technology is estimated to grow at a higher CAGR during the forecast period. In wireless technology, the use of wires is eliminated, thereby abolishing the need for installation and protection of cables, which noticeably reduces the cost of the wireless smart lighting systems. The hardware segment is expected to hold the largest share of the market based on offering by 2023 owing to the fact that hardware components are the integral elements of the smart lighting system. Hardware offerings have been further categorized into lights and luminaires; and lighting controls. The lights and luminaires segment includes smart bulbs and fixtures. Moreover, lighting controls include LED drivers and ballasts, sensors, switches and dimmers, relay units, and gateways. Lights and luminaries are the lighting components of the smart lighting systems. These components broadly include smart bulbs such as fluorescent lights, light emitting diodes (LEDs), and high-intensity discharge lamps (HIDs). However, the performance and characteristics of the light source used in lamps depend upon the lighting task being performed. Choosing a right lamp type helps save energy to a great extent. In the application type segment, indoor application (residential, commercial, and industrial) is expected to hold a larger size of the smart lighting market during the forecast period. In the residential application, smart lighting can be installed according to the requirement of a particular room or an entire house. The incorporation of wireless technology in smart lightings would help the market for residential indoor application to grow at a high rate. The commercial application of smart lighting includes the implementation of these lightings in offices, retail shops, shopping malls, and hospitality infrastructure. Reducing energy consumption has become a major objective for building owners, governments, utilities, and other stakeholders. Replacing existing lights with more energy-efficient lighting sources, such as LEDs, is one of the ways to reduce massive energy consumption, but it is a small-scale solution. On a large scale, energy reduction can be achieved by turning the lights off when not required, optimizing light levels to suit the workers’ needs, and reducing the overall demand for lighting energy. These measures come under smart lighting arrangement, which is the best way to ensure the automatic reduction in energy consumed in lighting task. APAC is expected to be the fastest-growing market for smart lighting during the forecast period. The smart lighting market has enormous growth potential in APAC, and these systems are likely to be accepted by consumers as an integral part of a digitalized household. Moreover, the emerging economies of China and India have a positive impact on the overall market in APAC. The increased construction activities in APAC are contributing significantly to the growth of the smart lighting market in the region. The expected construction of ~200 million homes in China and 18 million homes in India is likely to provide several new opportunities for energy-efficient lighting and home automation in the next few years in this region. Rising government expenditure on public infrastructure, increasing the adoption of energy-efficient lighting systems are the major driving factors for the growth of the smart lighting market in APAC. Some of the major players in the smart lighting market are Philips Lighting (Netherlands), Hafele Group (Germany), Acuity Brands (US), OSRAM (Germany), Cree (US), Hubbell (US), Zumtobel Group (Austria), Honeywell (US), Legrand (France), Eaton (Ireland), Lutron Electronics (US), and General Electric (US).